The last time I sat down with an issue of Wolverine: First Class, I was impressed by the book's casual glimpse at life in the Xavier mansion between super powered fistfights. And, judging from this month's issue, that seems to be one of the cornerstones of the series. I love how matter-of-factly Kitty Pryde explains that the Danger Room actually isn't the most secure place in the mansion, that despite its strict security guidelines it gets "invaded and trashed quite a lot." I was thinking the same thing myself, actually, and it's nice that the characters don't have such a degree of tunnel vision as to ignore the room's constant use as the backdrop for enemy onslaughts over the years. If the same device has been used enough times for the readers to roll their eyes when confronted by it, certainly the book's characters should respond in a similar fashion. Because they do, they're granted a certain degree of honesty and believability. While the title's out-of-continuity status leaves a slightly bitter taste in my mouth, as if we're just treading water here and never really accomplishing anything, Fred Van Lente's simple, identifiable dialog and spectacularly everyday plot ensures that such worries are relegated mostly to the back of his readers' minds. Even if the in-continuity Kitty isn't even close to a teenager any more, assuming she's alive in the first place, the issue's brief, relatable glimpses into her psyche add enough depth to her personality to entertain readers with even a passing interest in the character. Van Lente not only shines with his characterization, his strong sense of comedic timing brings a lot to the table on its own. While the visual puns do sometimes run the risk of going a bit too far, in the end they're kept in check and don't subtract from the experience. Salva Espin delivers relaxed artwork that fits the cozy nature of the issue. His lightly detailed, casual art direction and focus on his characters' facial expressions and body language reminds me of Stuart Immonen's efforts on Ultimate Spider-Man, although Espin lacks that certain flair for the spectacular that's seen so commonly in Immonen's work. Espin also doesn't bring the kind of care and attention to detail in his backdrops that his USM contemporary consistently delivers, but that's not something I'd say is necessary here. 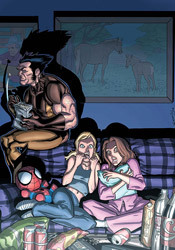 Where Spidey is usually fighting for his life in between petty teenaged arguments with girls, the worst thing Kitty, Siryn and Amp can do in this issue of Wolverine: First Class is disturb Logan from his session with the TV set during the Stanley Cup Finals. This series isn't going to dazzle you with its long, intricate plotlines or shock you with its sudden, unpredictable twists and turns. If you're looking for that style of storytelling, you won't need to look far to find it. Wolverine: First Class isn't your typical X-Men series; it's more interested in the characters than their powers, in adding a touch of humanity to a team that's usually dealing with deeper, darker matters. It's rare that I'll enjoy a light-hearted, semi-serious series as much as I do this one. It's not perfect, and it sometimes reads like a teenaged girl's manga, but it never lags and I found my attention rapt from start to finish. I'll recommend you give it a borrow, which is more than I can say for most of the other titles in the X-Men line.